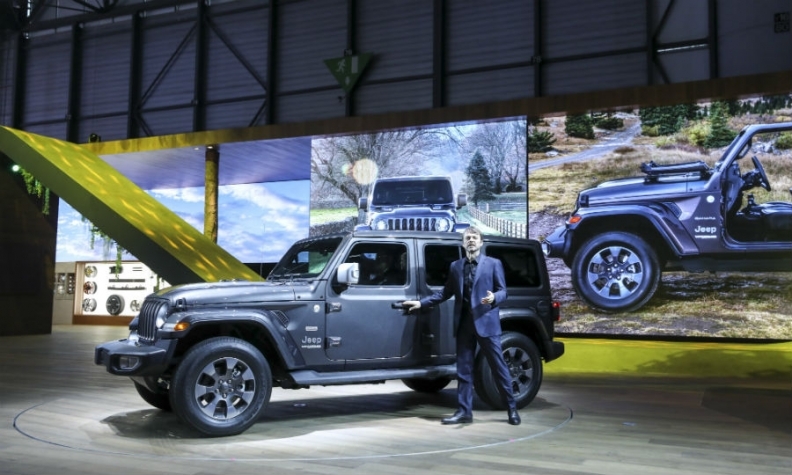 Jeep Boss Mile Manley introduces the Wrangler Sahara Edition at the Geneva show. Fiat Chrysler Automobiles' display at this year's Geneva auto show highlights how diminished the once-dominant Fiat brand is these days. Jeep got the prime position on FCA's stand, ousting Fiat from its traditional spot. Jeep was given the big corner stand while Fiat moved to a much smaller center stand, close to Abarth and Alfa Romeo. Being center stage at an auto show means no big back billboards and screens, so there is much less chance to attract visitors. The Fiat stand displays the brand's 500 range (the 500, 500L and 500X) plus a Tipo compact sedan, and a 124 roadster. The Panda minicar is absent even though it is Fiat's No. 2 seller in Europe after the 500 three-door. This may hint that FCA moving to leverage the 500's success by making the range a subbrand. Neither Fiat nor Alfa Romeo had any new products to show in Geneva and neither brand held a press conference. That was in contrast to Jeep, which had two European debuts with the new Wrangler and the refreshed Cherokee. Outside of Europe, Jeep and its sibling brand Ram provide the bulk of FCA's profits in the North American market, which last year accounted for 75 percent of the group's 7 billion-euro operating profit. Jeep has also been expanding its business nicely overseas. The marque sold 1.4 million vehicles in 2016 before dropping slightly to 1.39 million last year. Jeep targets 2 million sales this year. At the Detroit auto show in January, FCA CEO Sergio Marchionne said the group had done a lousy job in Europe with Jeep, so Geneva is the ideal place to try and give the brand a fresh start. Jeep boss Michael Manley said the brand hit the ground running this year, with sales jumping 40 percent in Europe, mainly thanks to the Compass. January sales were up 67 percent, while Fiat's European sales fell 5.7 percent. Jeep's European sales of 12,000 in January are still tiny compared to Fiat's 59,000, but if Marchionne is playing the long game with his strategy, the gap is bound to become smaller and smaller.